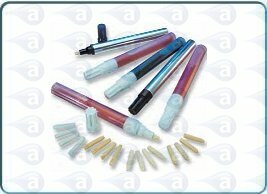 Dispensing pens offer a simple way to apply low viscosity liquids without mess, waste or harmful fumes. 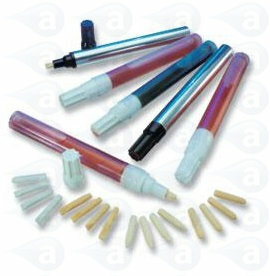 The pens are supplied ready to fill with the liquid of your choice. The felt, polyester or acrylic spring loaded nib assembly is clipped into place once filled. A plastic cap seals then pen for storage. Press the nib againt a surface for a controlled flow of liquid without drips. 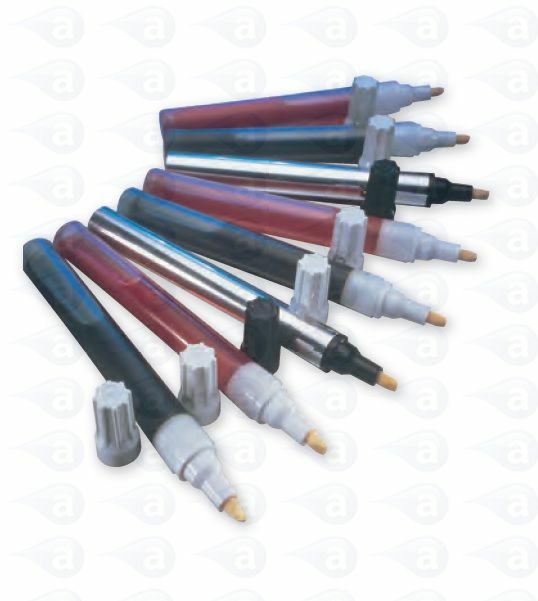 Aluminium or plastic bodied dispensing pens and bottles with felt, acrylic or polyester nib assembly and cap seal. Ideal for applying inks, coatings, adhesives, solvents, primers, coatings and activators. Spring loaded felt nib allows liquid to flow when pressed against a surface. Shuts off to eliminate drips. Supplied unassembled ready for filling and dispensing. Caps allow for filling and storage. Also available supplied pre-filled with your specified liquid if required. Supplied in a sealed pack of pens. We ship these parts direct from stock from our UK warehouse. Please contact us to discuss your application and one of our Product Specialists will assist. Spring Loaded Nib Pens. Dispensing pens where the solvent is placed inside the body. As the nib is pressed against a surface, it retracts allowing a gap for solvent or primer to flow onto the nib ready for application. 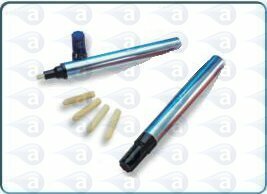 The pens come supplied with body, spring nib assembly, nib and push on cap seal. Typical Uses: Applicators are all tested and suitable for handling solvents, primers and solvent based glues. They all use wetted parts designed for liquids to be applied safely. Common Applications:- Deposits of solvents, solvent based glues, cements as well as primers, activators, fluxes and other liquids. Solvent cement, plastic welding, repairs, cases, displays, primers to rubbers, etc. The products are robust and handle most liquids and fluids dispensed from them. Supplied with full instructions and our full technical support by phone or email. For dispensing machines we include all fittings, tubing, connectors, adapters and a wide selection of precision dispensing tips with the system. Items are shipped from the UK by a courier on a tracked and insured service for all items that are available from stock. Items on a lead time will be shipped as soon as they are made available. Warranty: All dispensing products are covered by a 1 (one) Year manufacturers warranty against fault. These products are disposable. Copyright 2019 Adhesive Dispensing Ltd. All transactions subject to Adhesive Dispensing Ltd standard Terms & Conditions, E&OE.